The wireless earphones are backed by a 150mAh battery, which promises to deliver up to six hours of playback, on a single charge. The earphones come attached with a neckband that allows you to control music with multifunction control buttons. 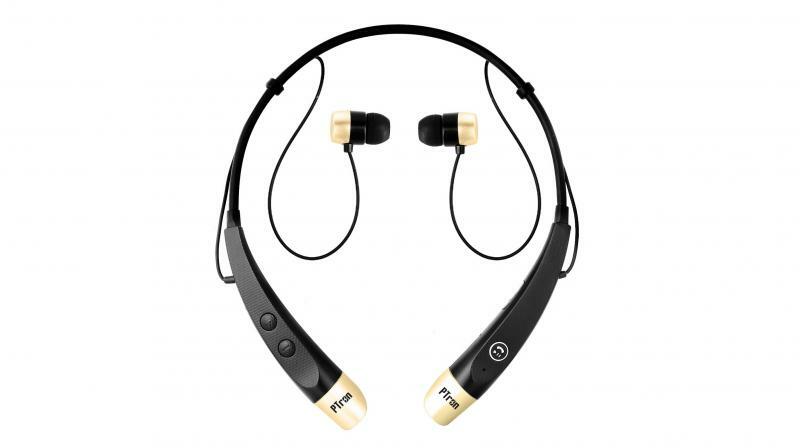 PTron has launched its new ‘Tangent’ wireless neckband earphones, that features ergonomic sporty design, Bluetooth wireless connectivity, magnetic ear-buds, and polymer battery. The wireless earphones are backed by a 150mAh battery, which promises to deliver up to six hours of playback, on a single charge. The Bluetooth v4.0 allows you to pair the headphone with your device. The headphones have a built-in microphone for hands-free calls that is said to deliver the finest call performance. It has a frequency response of 20Hz-20khz and offers up to 10m range. It offers an Impedance of 32ohms. The company says that the earphones are built to provide consumers who look for the best music and an ergonomic design. The earphones come attached with a neckband that allows you to control music with multifunction control buttons. It is available in two-tone colour options — Black/Gold and Black/Silver and retails at a price of Rs 7,99 via the company's online store, Flipkart and Amazon.